It is the most wonderful time of the year and everyone’s schedules are jam packed with everything from Christmas shopping to baking cookies with your grandmother to holiday parties! 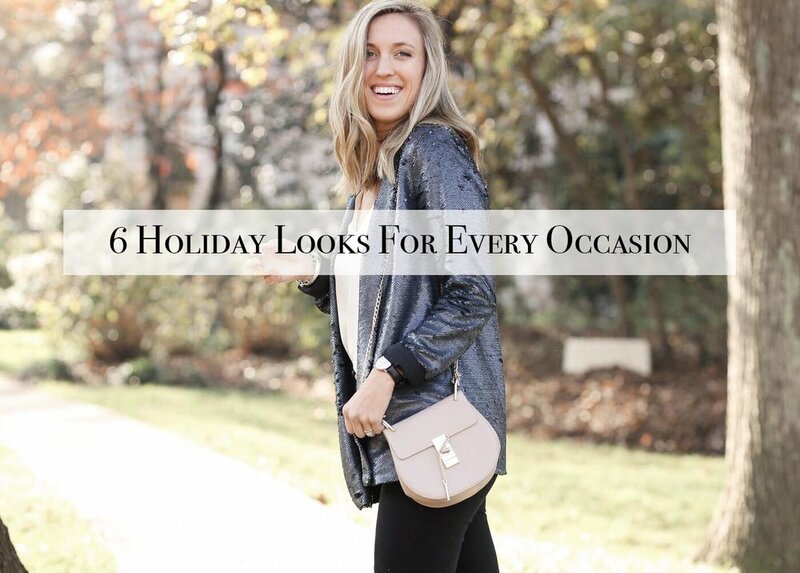 I always leave choosing what I am going to wear to holiday parties to the last minute because of how hectic the month of December is, so to make the process slightly easier on everyone, I have put together 7 looks for every holiday occasion! I will go through sizing, how the items run and links to everything! Enjoy! I have been posted about this jacket so much lately because it has become one of my all-time favorite pieces in my closet! I am wearing a size small and the sleeves are a little bit long for me so I rolled them up and actually like it better that way! This blazer runs TTS. The jeans I am wearing run slightly big because of the stretch in them, so I am wearing a 2/26. This look would be perfect for any holiday party, whether you are headed to a work get-together or to a friends Christmas party! This look is one of my favorites also because of the bomber jacket. This is such a great transitional piece between multiple different outfits making it one of my top 5 pieces for the holiday season! I am wearing a size small and would say it runs TTS or every so slightly small. The boots I am wearing are definitely an investment, but I finally decided to splurge after eyeing them for years, and let me tell you…..it is WELL worth the money. These boots will last for years to come and look great with dresses, jeans or skirts! This is the perfect outfit for hosting the best Christmas party ever. Hanging out with the family and have nothing to wear? Grab this sweater before it’s too late! With the higher neck, soft grey material and statement earrings, this outfit will keep you comfy, cute and festive for the holiday season! The sweater runs TTS and I am wearing a size 4. Whether you are hanging out with friends for New Years or looking for a more sparkly top for a holiday party, this look will win every time. The high-low style and sparkles of the top make this a go-to for any occasion that have going on. The top runs TTS and I am wearing a size 4. The emerald/aqua earrings I am wearing are linked HERE and are so light weight you could wear them all day! There is only one time of year that red makes an appearance in my wardrobe, and no, I’m not talking about Valentine’s Day :) During Christmas, one of my most worn colors is red because it is is festive, looks good even when you haven’t been in the sun and helps to get you in the holiday spirit! This red top is under $50 and comes in three colors, but it does run large so I sized down to the XS. As I mentioned above, red is not a color I wear year-round, so when I do decide to bring it out and dust off the cobwebs, I want to make sure I do it in style. This red tank has a button up deep v back, giving it a little bit of a dressier top compared to the last one. This look is one that can be worn with a blazer over it for an office party or as it is for dinner over the holidays. The top runs slightly large as the the pants, so I would suggest to size down in both of those! Below are more items that I absolutely love for holiday parties! All you have to do is click on the item you like and it will take you directly to the page! Please let me know if you have any other questions about sizing, looks, etc!